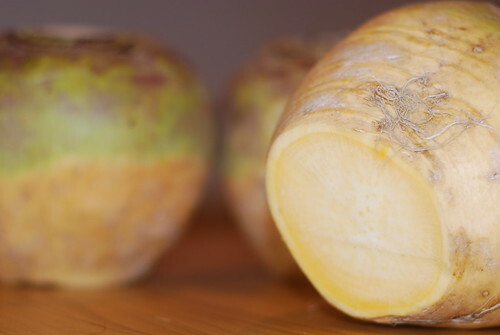 Known as a neep or tumshie in Scotland today, the type of turnip typically used for carving at Samhainn is the swede, yellow turnip, or rutabaga as it’s commonly known elsewhere. Lanterns for this time of year have historically been carved across Ireland, Scotland, and parts of England as well as the Isle of Man,1 but their origins are somewhat murky. It’s difficult to say how old the custom is, though it’s important to note that the vegetable isn’t native to the Islands of Britain and Ireland, only being introduced in the seventeenth century. It’s possible that alternatives were used prior to the adoption of the tumshie itself, with the tumshie superseding them because of their bigger size, though we can really only speculate. The use of potatoes, various beets, and even apples is also traditional and historically attested (though they themselves are not native plants either), but regardless of whether or not it might be an ancient practice (or an adaptation/evolution of one), the traditional lantern is undeniably a part and parcel of the season’s festivities today. It’s the tumshie that’s typically seen as the forebear of the modern pumpkin lantern, and it’s the tumshie that springs to mind when we think of the “traditional” lantern.2 Tumshies are often skull-like in shape and the two-tone purple and off-white skin helps to accentuate the similarities with a skull once it’s been carved and lit. The flesh is quite tough to cut through, but scooping out the insides isn’t quite as hard as you might think if you have a knife and a sturdy spoon handy. White turnips are a lot softer and easier to scoop out, but being smaller, you’re not likely to be able to put a lid on without the candle going out; the same goes for beets, large potatoes or other types of root veg that have also historically been used. Whether that’s original to their purpose or just something that came to be attached to the lore surrounding them is difficult to say because references to them are hard to find, but the aim of them is to look as sinister and threatening as possible, both to scare and – if they’re being taken around guising – to blend in with the other spirits that are abroad. In many parts of the world, putting them at the window will attract guisers too, because it lets them know they will be welcome to knock on your door. The strong smell (or stench…) of the flesh as you carve it is very evocative, and apt for the season – it’s a sickly sweet sort of smell that’s reminiscent of rotting and decay. It can be very off-putting at first, so it’s best to carve them somewhere that’s well ventilated. Because the flesh is quite hard it’s probably best left to an adult to scoop it out unless any children who want to have a go are responsible enough to be trusted with knives; it can help if you buy tumshies that aren’t waxed and have been allowed to sit for a while and ripen well. This doesn’t exactly soften the flesh, but it does make it easier to work with. Children can design the faces if they want to get involved, or else you could give them a smaller, white turnip, beet, potato or a pumpkin to try scooping out while you tackle the tumshies. 1. You will need as many tumshies as you want to carve, along with a sharp vegetable knife and a sturdy spoon for scooping out the flesh – the larger the tumshie the better, although of course they’ll need a bit more elbow grease… A pen is handy if you want to draw the face on before carving it out, and a very sharp artist’s knife or a pumpkin carving knife can be used for carving out the features of your face if you want some precision. A vegetable knife works fine for this, but you might find your results are a bit crude – which isn’t really a bad thing. If you want to hang the lantern(s) from a pole, then you will need some thick wire (and a pole, obviously). 2. Cut off the top of the tumshie just at the widest point of the vegetable. If you need to, cut the root end so it’s nice and flat so the lantern will be sturdy enough to stand safely on its own. 3. Now it’s time to carve out the middle of the turnip. Score a cross into the middle of the flesh, as deeply as you can manage, and then stab the knife into the centre of it and scoop round in a circular motion. Bits of the flesh will start to come out, leaving an indent in the centre. Keep going until you can use the spoon to scoop round the insides – the spoon allows for a little more precision. The flakes of flesh that come out can be put into a bowl and used for cooking later (they’re tasty if you mash them with carrots and lots of butter, and will go well with the Samhainn feast). 4. Keep scooping out the insides until you get down to the bottom, and towards the sides. Leave the sides at least half a centimetre (or quarter of an inch) thick, to make sure the lantern will be sturdy, but carving out the face won’t be too difficult – if the sides are too thick there will be a lot of resistance when you start carving, which can lead to your knife going off in a direction you don’t want it to! Too thin and the wall of the tumshie is likely to split where you don’t want it to. If you’re going to hang the lantern, though, you might want to leave the top of the tumshie a little thicker that the rest of it, to make sure the wire can be threaded in without splitting the walls. 5. Scoop the bottom of the tumshie out nice and flat, to make sure your candle can sit evenly (small LED lights can make a good alternative if you can’t use a naked flame). If the lid is quite thick, scoop some of the middle out to make sure there’s plenty of airspace inside. 6. 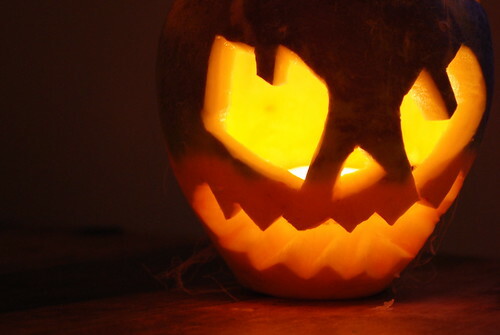 Draw on your scary face with a pen, or score it out using your knife before carving it out. Remember to make the face as sinister as you can, and make sure the holes are big enough to allow plenty of air in, to keep your candle lit. 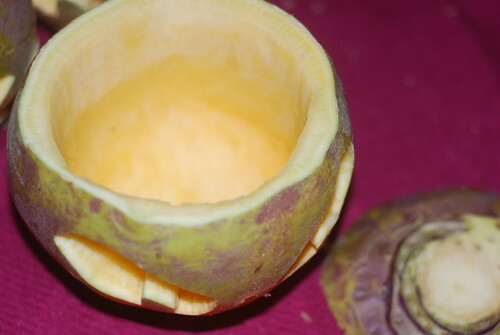 You can always cut an airhole or two into the lid, or round the back if you need to, though. 7. If you’re hanging your lantern, you’ll need to punch holes into either side of the face you’ve just carved – you should be able to just poke the wire through and then turn the end up inside the turnip to stop the wire from falling off again, but remember to attach the wire to the pole in some way as well. The sturdiest way would be to drill a hole through the pole so you can feed the wire through it before you attach it to the other side of the lantern. 8. You can light the lantern(s) from the Samhainn bonfire (the Samhnag) as part of your opening celebrations and put them at the window to keep the spirits away (and attract guisers). 1 Hutton, The Stations of the Sun, 1996, p382-383; Danaher, The Year in Ireland, 1972, p217/218. 2 Pumpkins are not native to Europe, and it is thought that Irish and Scottish immigrants in nineteenth century America adapted the custom, substituting pumpkins in place of turnips. Every year you’ll find articles talking about the traditional turnip, and its rise and fall in the face of competition with the pumpkin. Likehere, or here, or here… In 2008, in fact, the Manx National Heritage on the Isle of Man gave out free turnips to children who visited the National Folk Museum. See also: Hutton, The Stations of the Sun, 1996, p382-383, and Bettina Arnold’s Hallowe’en Customs in the Celtic World. 3 As given by McNeill in Hallowe’en: Its Origins, Rites and Ceremonies in the Scottish Tradition, 1970, p33.